Wow cool, i can be in this race! Aged 40. Mint is randomly not updating my retirement fund over last couple of days annoyingly, but i am taking it from there too. This includes all except a few gold and silver coins and my older Subaru. I will join in on the fun. I am currently at $222000 and would like to hit $250,000 by next Christmas. This is done on a teacher's salary of about $60,000 a year. I will be using net worth to include house value ( I know some people are unsure if they will count that or not). I'm in, I am currently at $219,713. I am including the house and am using personal capital to track. I hope to reach $250,000 by 10/2016 all going well! Made a simple spreadsheet for myself because I'm canadian and we don't have Personal Capital. I'm happy with the savings rate considering that we have a 1-month old baby and had a few expenses + our propriety taxes last month. We had a pretty decent tax return though that helped a lot (9.3k). The last 6-months will be a bit different with my gf being on that parental salary replacement which will end up being about 40% of her normal salary. Love your graphics, BarbeRiche! I have similar ones but the monthly changes are not as exciting! I may plot them yearly like this though. Before I got into MMM this year, we were paying our mortgage very fast and not investing as much, now I get some satisfaction from seeing the proportion of our net worth in our mortgage decrease and the proportion invested increase, so I've been plotting those out as well. I also have a Spendings-Savings Ratio monthly graphic but it was a bit too much for the post and I think the yearly one is more representative. Jan-49% / Feb-33% / Mar-75%...fluctuates a lot. It is nice to get a visual of the asset allocation, I agree. I plan on reducing the house principal % as well! Nice graphics, but why are you showing asset location (account type) as asset allocation? I didn't want it to reflect my positions in the market but more of a taxable/non-taxable type of thing. Maybe asset is the wrong term? I might do one just like yours but it would be a bit complicated as we are spread around a few accounts. We both have company RRSP contribution plan which are managed by our companies + RRSP invested in ETFs + TFSA invested mostly in microcaps + stock pension plan for me, etc. Are your investments all ETFs or you pick stocks? all ETFs, and I treat 7 accounts as one asset allocation plan. 2 of the accounts are work sponsored "collector" accounts that I transfer to self directed ETFs once a year. but, especially if you're spread out all over the place in many accounts, a summary asset allocation will help you understand your holdings, and make a better plan. Just start by adding up totals. Heck, even start with a Bonds vs Equities summary. Let's say your TFSA is in a 90/10 fund, your RRSP is in a 30/70 mutual fund and your spouses taxable account is all Canada stocks (one company). What is your total Bonds to Equity ratio? (for example). Good point. I will do that. It will be a good addition to my spreadsheet. 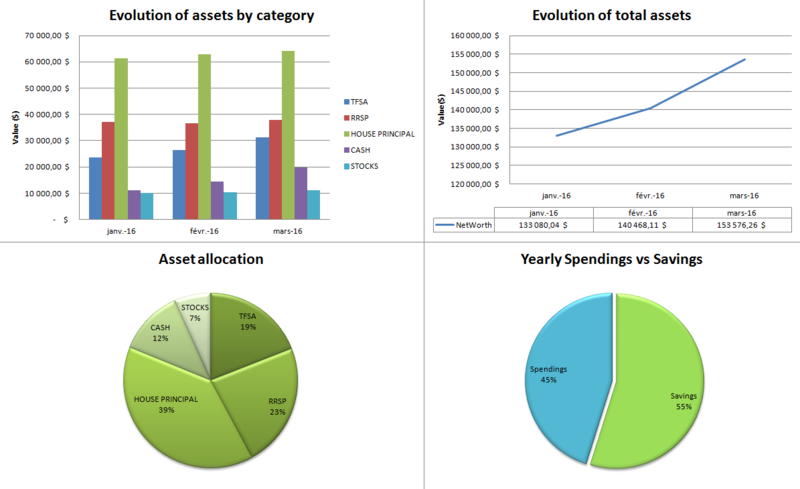 Yeah, I actually spent some time figuring out our Pension's overall asset allocation recently (40% bonds 60% equities). I am much less conservative, so to balance this out, I went with 10% bonds and 90% equities for our personal investments, which overall averages out to 25% bonds and 75% equities. 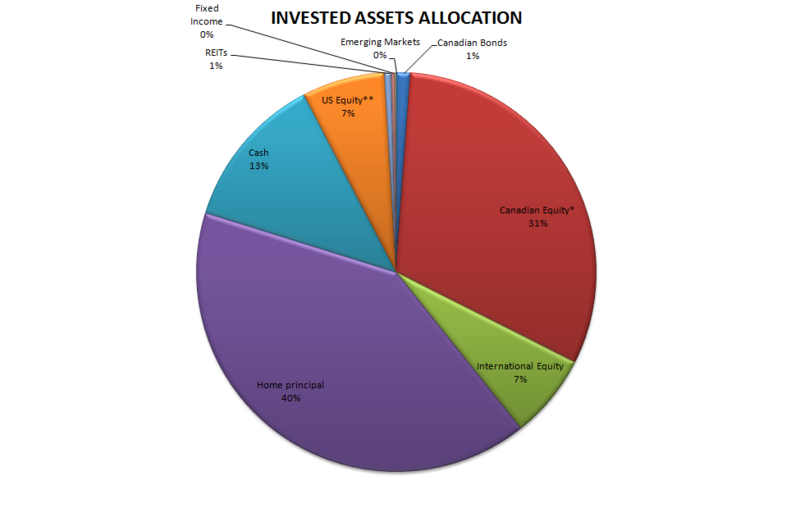 It seems a bit too much weighted toward Canadian Equity but almost 100% of our TFSA are invested in canadian microcaps. Also, my company stock purchase plan counts for a big part of that (about 20% of the canadian equity). It should balance out a bit while I continue to max our RRSP + our company funds that are more weighted toward US/International. I can also sell some of my company stocks gradually (have to hold them for 2 years so I don't get penalized). Awesome BarbeRiche! I'm curious - did you know you were hometown biased before doing this graph? Do you mean because the months are written in french? I actually changed all my spreadsheet in english and noticed that but I thought it would show anyway with the way I formulate my ideas or choices of words sometimes..! :) No, by hometown bias I meant mostly invested in Canadian stocks. Oh I see. It did help to get a visual. I had a rough idea but it's a lot clearer now. It will be easier to decide if I sell some of my company stocks or if I need to rebalance my portfolios. I'd been avoiding posting to this thread for the longest time because it seemed like such a big goal, but now that I'm a little ways in, it doesn't seem so daunting. We came into a small windfall late last year but instead of investing I decided to get rid of the PMI on our mortgage, especially since market returns were poor. Plan to be at about 215,000 by the end of the year, 250,000 by next summer. We also plan to sell our place around that time to move elsewhere and will like spring to about 330k. That puts us at just under 2 years to make the 100 to 250 hurdle, compared to the ~1.5 years to do 10k to 100k. Here's to getting some good market winds and nice fat bonus. Great to have you here. It really is quite amazing how fast it accumulates after the 100k point. And a big Welcome Here! to anyone else that has joined and I forgot to welcome. I know this group tends to be a bit quieter than the 10-100k, but I like to think that's because we're too busy enjoying the freedom that you can only buy with money you don't spend. I expect this room to light up a bit in a couple days though as everyone begins to sound off their current status reports. Mine doesn't, wonder what I am doing wrong? Is it just the market? It has stayed in the minus range for aggggges. Just recently i changed everything to vanguard index funds so hopefully that will make a difference. What are you invested in if you don't mind me asking? Just being in Vanguard doesn't protect you from bad investments. ah I was trying to be smart with my screenshots, I think it cut off the side perhaps too. Let me try again. I only recently changed it all, and did my final couple of transfers, it used to be 12% international, so this is going forward. I don't want to keep this thread off track but I do want to respond. I think part of your losses have just been the general downtrend of small caps and international stocks. Also your long-term bonds have done poorly the past year as well. They aren't a replacement for other typical bonds (a total bond market fund or intermediate fund). They are a lot riskier. Same goes for the inflation protected bonds. There are a lot of unanswered questions about their viability. If you have a different bond choice, I would switch to that. Or at the very least if you haven't already, read up on the risks of long-term bonds. Not to say there aren't good portfolios with long-term bonds, but I think it's common to misunderstand them. I did ask HR to add the total bond index fund but i dont think they will. I will def look into that link today, so far I have only been reading about the Stock stuff and havent got to the Bonds bit yet on the stock series or the books. Glad to hear i haven't being doing a HUGE error these last few years. THANKS! Sorry for hijacking everyone!!! Closed the accounts today for March and I was pushed along a bit farther than I thought. are you still contributing? if so, your goal of prices going up just means you'll be paying more. Hmmm.... Buy low, sell high. Decided to forgo the appraisal. Unnecessary expense just to tell me what I already know. Big jump in net worth this month reflects $25k increase in equity due to kitchen remodel. We are getting close to leaving you guys :D I always get sad when I see how much other folks increase their NW on a monthly basis, but I realized if you max a 401k and two IRAs you still are saving almost $2500 in investments a month. That's a lot it turns out. Sure it's not the $5k or $10k some folks do but hey... slow but steady, right? 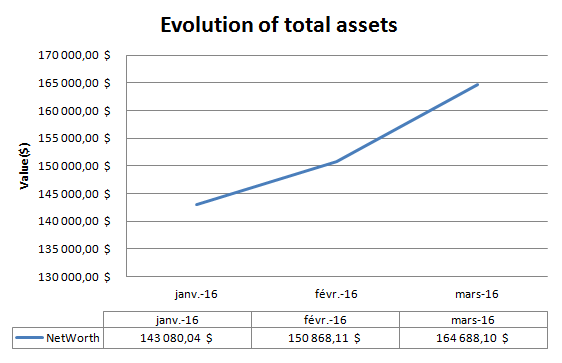 We're on pace for about a $50k/year net worth increase from this time last year. Though this is a bit artificially high as we repaid ourselves our tithe last year after pre-tithing for tax perks. We might also be buying a house in the near future, not sure how that will affect things. But we're getting close to leaving this thread and heading to the 250k-->500k one. Which is super exciting! Had a small windfall in March as well as a bonus check which went straight into my Roth. Total NW including real estate and cash savings: $191,475. April is going to be a spendy month as we owe a lot in taxes this year, but we should be able to graduate from this thread in May if the market cooperates. Damn, nicely done! Almost time for the next thread! I closed March with a NW of $100,869.59! Barring a big market downturn in the next few weeks, I should be here to stay! $250k seems far away, but I'm pumped to be entering the next 'bracket' of accumulation. By the numbers I had an amazing month. Most of hte credit shouldn't go to me though. Markets were responsible for $6523.57 of that $8476.74 increase in NW. I started working again a few days ago so I am looking forward to full paychecks and being able to contribute to the 401k again! After last months small increse, I killed it this month. I had alot of extra income this month which helped: taxes, coahing, bonus, etc. I don't think I officially joined this challenge. But I am ecstatic to say the markets and a bunch of 401k front-loading has brought us past the 250k NW mark! That's pretty crazy to think about. Especially when 9 years ago our NW was -250,000. I guess its easier to stash money when your dollars are working for you instead of being spent paying off debt. We were blessed with a high pay contract job with unlimited OT in 2015 which allowed us to max out 401k's and IRA's for the first time ever. therethere - come join the $250 to $500k thread! We crossed the $200,000 mark! Woo hoo!